flange surfaces are presented with a spiral of alternate metal/filler layers. where bolt loading is limited. • Gaskets are made to a wide variety of sizes and shapes. • Combinations of metal winding strip and filler are selected to suit the fluid media and operating conditions. • Quick to install and remove. • Operating temperatures from cryogenic up to 1000°C. • System pressures from high vacuum to over 350bar. • Support rings, inside and/or outside of spiral, make gasket suitable for high line pressure on flat or raised-flange faces. Products are manufactured in accordance with all relevant gasket standards to suit flange designations: ASME B16.5, BS1560, ASME B16.47 Series A (MSS-SP44), ASME B16.47 Series B (API605), BSEN 1092 (BS4504); plus DIN, JIS and NF. Aluminium and lead also available. 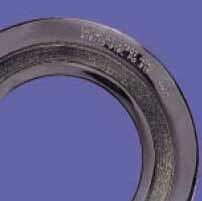 Metaflex gaskets seal up to 350bar, although higher pressures can be considered. Standard materials: stainless steels 304L and 316L. Other materials include: 310, 320 and 321; Monel 400 and K500; nickel 200; titanium; Inconel 600, 625 and X750; Incoloy 800 and 825; Hastelloy HB2 and C276. Standard material: carbon steel. Other materials include: stainless steel 304L, 316L, 320 and 321; titanium; Monel 400 and K500; nickel 200; Fluolion® PTFE (inner rings only); Duplex UNS 31803. Largest non-standard gaskets manufactured to date are 5070mm diameter. Almost any combination of component materials is available. Profiles include circular, obround, square, oval and diamond. Gaskets for nonstandard flanges are made to order.